I'm 'bout half way thru a project that I just realized is gonna become a problem. Client wants a "cap" on a half wall that's 4' or so high. Sections of the wall run as much as 30' long. I'm using 6/4 walnut in sections 6' long. Since I can't get heart wood consistently wide enough I'm making 'em outa two pieces 3 1/2" wide w/ a maple strip 3/8" wide running down the center. Anyone have a suggestion on how to deal w/ the expansion in the summer? The place is air conditioned but I'm sure that a 6' section is gonna creep even w/ small rise in RH. I plan to bevel cut the ends at 30* to hide the seams as much as possible and hope to be able to hide imperfections in the wall (you know they won't be straight and the corners won't be a 45*). Would it be possible to glue some strips of MDF on the bottom to stabilize the walnut? And other ideas or suggestions? You mean expansion across the length of the piece? I can't say that I do see the problem. Wood movement causes a problem when cross grain is fixed to long grain. long grain to long grain does not cause a problem. I think I see the issue. The 3 1/2" walnut + maple strips will be vertical correct? So you have a cumulative effect across 6 feet of cross grain expansion/contraction. You'll need to do one of 2 things. Either T&G or lap join the boards or if all are edge glued together, allow one or both ends of the finished panel to float in a frame, or maybe hang the completed panel on a french cleat. I think you will need a frame around it in either case. A sketch of what you are doing would be helpful in helping you. Ya know I quickly read this yesterday and was prepared to give an explanation about expansion/contraction along lengths/widths much like the others have done; but, yes, thought I mis-understood the question as well. Borrowed, interestly enough, from The Bench Dog one man's thoughts and adventures as a beginning woodworker. Last post was last year; hope he didn't give it up. Anyway, after re-reading Ole's post I think the problem lies in the 30' long sections. You are concerned that this section will be created in 5+ six foot long lengths that are scarf-jointed together. Your concern lies in how this joint will withstand the shrinking/expansion across its width, correct? I would expect the cap to expand and contract at the same consistency across all the sections; they are made from the same species in the same orientation, yes? I can't say that you couldn't run your finger along the edge and feel a slight bump, but it'll likely go unnoticed. I'm sure others with better carpentry skills can elaborate more effectively. Dan, I think you're right. 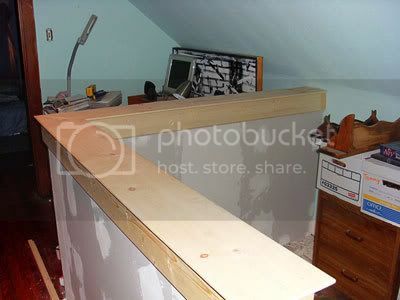 Some how I had it pictured in my peabrain that it was half of a wall where the upper half would be paneled. Should have stopped at 2 drinks. Wow, didn't mean to cause all the confusion. Let's try to clarify....and confess to my ignorance. Dan's right about my version of the half wall (see his pic). I'm doing the cap on top. I'm not worried about expansion across the cap, I'm worried about the 30' run. It has always been my understanding that when the cells absorbed moisture the got fatter and expanded across the grain, sorta what everyone is seeing as the problem. But, I also thought they got longer as well, prompting my concern. I'm doing this in 6' sections which I thought would tend to get longer and cause the whole thing to push up at the scarf joint. Everyone seems to be saying this is not a problem and I sure hope everyone is right 'cause I gotta go w/ it now. If next summer the cap starts to look more like shingles you will all certainly hear from me. a rough rule-of-thumb, wood undergoes about 8% tangential shrinkage, 4% radial shrinkage, and 0.1% longitudinal shrinkage from the green to ovendry condition. This is from green to oven-dry, say 30% to 8%. Your Walnut will likely only fluctuate from 9% to 12% moisture content.